Located northeast of Atlanta, Suwanee is a town proud of it award winning history. 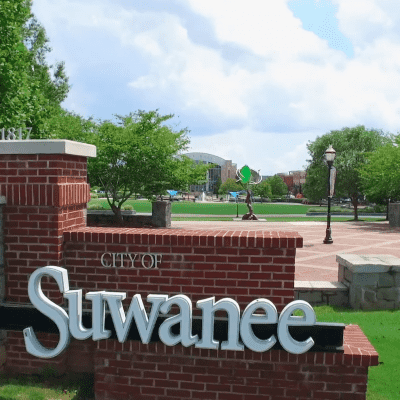 Suwanee has been voted as one of the top 10 best in the categories of places to live, raise a family, and best town for families by multiple publications. They have also been recognized as a Green Community by the Atlanta Regional Commission with the bronze level of certification. The history of the name Suwanee is up for debate. While some suggest is it derived from an Indian word meaning “echo,” others claim it was the Creek work for Shawnee. Both stories reflect the Native American history of the town, which started as a Native village. The population of Suwanee has grown drastically in the last 50+ years from under 700 residents in 1970 to over 16,000 today. Town Center Park is a popular attraction for visitors and locals alike. The Big Splash Interactive Fountain is an area with water geysers that are fun for anyone looking to cool off. Nearby, there is an amphitheater stage that provides a backdrop for concerts and other performances in the Suwanee. Shopper and diners can also find a wide selection to choose from while on foot.